Miss Webster is a retired schoolteacher who lives alone in a little cottage in the English village of Little Blessingham. Everyone in the village knows her but she couldn’t be said to be friendly with any of them. Miss Webster doesn’t mince her words and over the years her terse manner and dismissive attitude have made people steer clear of her. When Miss Webster is suddenly taken ill, the doctors and nurses are unable to diagnose what is wrong with her. She lies in the hospital bed day after day, staring blankly ahead, seemingly unable to speak. When a specialist comes to see her, a man with oddly disfigured hands, he gradually manages to get Miss Webster to trust him. When the time comes for her to leave the hospital she asks him for some advice, she doesn’t want to be in this terrible state, reliant on others and, frankly, she has become the sort of needy person she has always despised. He tells her that she must travel to a faraway place where French is spoken and that the trip will do her good. She follows his advice and soon after goes to Morocco. There the staff at her hotel show her the utmost kindness, making her feel part of their family. Miss Webster returns to England feeling much more positive and determined to make the most of life. One evening, a few weeks later, Miss Webster is about to go to bed when there is a knock at the door. She doesn’t know the young man, but he knows her. He is Cherif, the son of a Berber woman she met in Morocco, and he has come to England to attend an interview for a university course. At such a late hour on a Sunday night Miss Webster has no choice but to let him in, promising to help him find some digs the following day. The next day the accommodation office tells them there are no rooms so close to the start of term and Miss Webster decides to take a lodger. Miss Webster is intrigued by this beautiful young man and, besides, she has been alone in the cottage too long. She thinks some company will do her good. Before long her neighbours are talking and it’s not just about how young and handsome the young man who has moved into Miss Webster’s place is. “Miss Webster and Cherif” is set the year after the 9-11 attacks at a time when (and perhaps things have not since changed) young Arab men in the UK were looked upon with considerable suspicion and the question of who Cherif really is lies at the heart of the story. Miss Webster is an ardent liberal who doesn’t jump to conclusions and knows what is fair so she finds herself defending Cherif when her neighbours start to point the finger. However, while she knows that defending Cherif is the right thing to do, she starts to worry that maybe someone is trying to trick her; after her illness she is afraid she is being seen as someone who is gullible and nagging doubts about this handsome young man start to work their way into her mind. 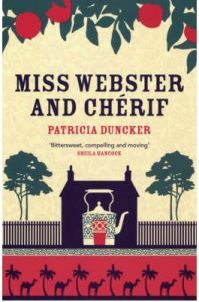 The quirky friendship that develops between Miss Webster and Cherif is at the core of the novel although it’s plain to see that the author, Patricia Duncker, has tried to throw in a political angle too. This is only partly successful and the unusual relationship between the 69 year old spinster and the charming young man easily overshadows any serious sub plot. It’s obvious why Miss Webster is so charmed by Cherif. He is polite and courteous and hard working and he is thrilled by most of the new experiences he encounters in this new country. It also thrills Miss Webster to know how much her neighbours disapprove of Cherif and she really blossoms as she throws herself into a friendship of the type she has never known before. The two main characters are wonderful. I loved Miss Webster from the beginning, even when she is cold and harsh, the proverbial English “cold fish”. The section where she is in hospital superbly written showing genuine empathy, a touching description of how ageing can be humiliating and how difficult it can be to acknowledge that you need help. Of course, Miss Webster rallies round and manages to get herself to Morocco where, at first, she doesn’t think much of the place at all. She would happily sit inside her hotel all day if it were not for Saida, the hotel manager, arranging a driver to take Miss Webster to explore the Morocco outside of the hotel. Miss Webster is staunchly liberal and open-minded; don’t mistake her spinsterhood for a lack of street cred. She excels in a crisis and proves herself to be resourceful and dynamic. She is the sort of character that would make a brilliant lead for a series of novels but I wouldn’t like to see that happen. Cherif is a lovely young man who treats Miss Webster with a lot of respect but ultimately the character is overshadowed by Miss Webster. Nevertheless the relationship between them is beautifully drawn and is at the same time comical yet touching. I have two criticisms of this book. The first is the implausibility which permeates the story. The trouble is that the overall scenario is believable yet the details jar somewhat. The hospital specialist tells his staff to give Miss Webster her own room and she stays there for two months! Imagine that, how many people would be delighted to have the hospital take such good care of their mother for that long? In reality we know that hospitals want the beds vacated and the inhabitants to be passed to Social Services as soon as possible. The level to which Miss Webster is willing to give up her own beliefs in order to accommodate Cherif is also a little beyond the bounds of belief, nor is there any need for it. We know she is tolerant and open-minded but some of her changes seem to go a little too far. The construction of the story was the other concern for me. Although it interested me a lot, there was no need for the section on Miss Webster’s trip to Morocco to be so long. This part was well written and the author creates an evocative portrait of the country but very little of it was intrinsic to the rest of the story. Oddly, the most of the interesting explanations and cultural references cropped up not in this section but when Cherif comes to England. Finally, the denouement is crammed into the last twenty or so pages which was far too rushed. In spite of these criticisms I loved this book, devouring it in a weekend. Miss Webster is a fantastic character and the story was quite gripping. I would recommend it to people who enjoy reading novels with quirky characters, perhaps along the lines of the novels of Alexander McCall Smith. No Comments on "Miss Webster and Chérif"